Some of the most influential people in the world work in the music industry. Whether they’re a well-known artist performing on stage or a producer working behind the scenes, their impact on pop culture, in general, is immense. Bringing in huge paychecks, many of these performers have been spotted wearing some pretty impressive timepieces on their wrist. Below are just a few of the most notable watch sightings of powerful people in the music industry. Many people might not recognize the name Max Martin, as this Swedish producer is notoriously private. However, he is one of the most influential people on our list, having written more Billboard #1 singles than almost anyone in the industry. His very first #1 song was Britney Spears’ “…Baby One More Time”, after which the writer has been responsible for 20 more top hits. While he isn’t spotted with a watch on his wrist very often, Max Martin was recently photographed wearing an Everose Yacht-Master reference 116655 on an Oysterflex bracelet, a choice that seems to complement his style very well. Jay-Z has a reported net worth of over $800 million and has been topping the charts for decades. To say that he has been influential in the music industry is an understatement. With such a massive amount of success, it comes as no surprise that the Hip-Hop mogul boats a pretty impressive watch collection, including everything from Vacheron Constantin and Audemars Piguet to Hublot. Recently, Jay-Z has been photographed wearing several Rolex pieces, including a yellow gold Sky-Dweller reference 326938, the widely sought-after Daytona reference 116500, and a platinum Day-Date reference 228206. The “I Can’t Stop the Feeling” singer rose to fame in the 1990’s alongside the group NSYNC. Since those days, his solo career has taken off, making him a fixture of the music industry. When it comes to his wardrobe, Justin Timberlake appears to be a one watch kind of guy, sporting mostly a gold 40mm Day-Date reference 228238 on a five-piece link Jubilee bracelet. Classy yet bold, this timepiece seems like a perfect choice for someone as influential in the music industry as Justin Timberlake. It’s no secret that DJ Khaled has an impressive watch collection. 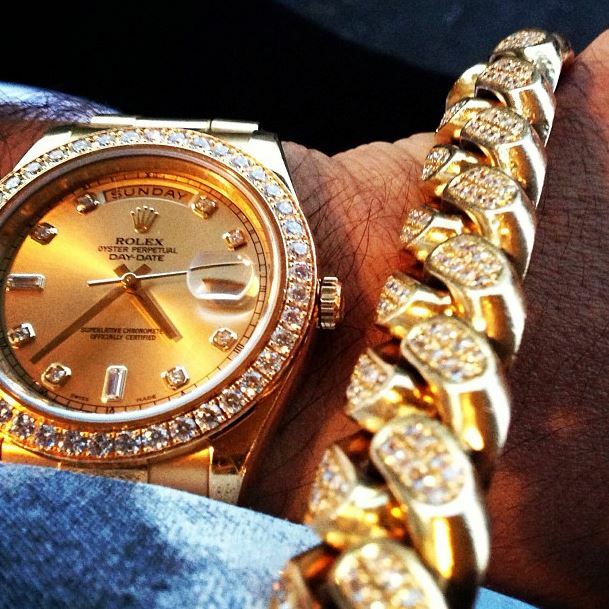 It’s even reported that the successful DJ recently purchased a $34,000 diamond Rolex for his young son. He’s made headlines in the past for sporting diamond encrusted timepieces on his wrist, such as a Patek Philippe Nautilus worth nearly $300,000. It appears, however, that the DJ has a preference for the Rolex Day-Date, wearing everything from a gold and diamond variation to the most recent addition to his collection, a special edition platinum Day-Date with an icy blue Arabic dial.